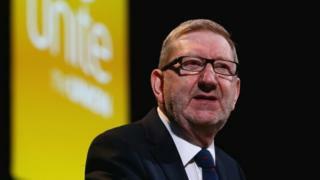 Len McCluskey has been re-elected as Unite's general secretary following a bitter leadership battle. The result is a boost for Labour leader Jeremy Corbyn, who has sent the union chief a message of congratulations. Mr McCluskey's chief rival Gerard Coyne - seen as the anti-Corbyn candidate - was beaten by nearly 6,000 votes. He said Unite, which is Labour's biggest donor, had to change and claimed he faced attempts by officials to "bully and intimidate" him. Mr Coyne was suspended from his job as a Unite official on Thursday pending an investigation. He faces accusations of bringing the union into disrepute over claims made during the contest, which saw barbs flying from both sides. The move did not affect the election as counting was already under way, although it could have put the result in doubt if he had won it. Speaking after the result had been declared, Mr Coyne said: "It has been a very close count and the ballot sends some very serious messages to Unite. "I am proud to have run a campaign that faced up to the issues that concerned members. "Unite needs to change, and it needs to put its focus back where it belongs: on looking after the real interests of the members of the union. "It's been a hard and robust campaign. The union machine consistently attempted to bully and intimidate me, something that has continued even after the close of polls. "Nevertheless tens of thousands of members backed my fight to change our union for the better." Mr McCluskey won 59,067 votes, Mr Coyne 53,544 and Ian Allinson 17,143, in a turnout of just over 12%, Unite said. Asked for his reaction to the result, Mr Corbyn said: "Congratulations Len McCluskey, well done. "The democratic process has taken place in the union. I look forward to working with him and indeed I've already sent him a message of well done." Unite acting general secretary Gail Cartmail said: "I congratulate Len McCluskey on his victory and would urge the entire union to pull together in the interests of our members, and not least to work for a Labour victory in the general election. "The turnout in this important election can give no cause for satisfaction and, while the tone of the campaign will not have helped, the underlying reason remains the archaic and expensive balloting system imposed on trade unions by law. "The sooner we can move to secure and secret workplace and online voting, the better for union democracy." Home Secretary Amber Rudd said Mr McCluskey was "now in the driving seat for Labour's campaign". She referred to the Unite's leader's past suggestion that Labour could form a government with the help of the Scottish National Party and Lib Dems, saying it would amount to a "coalition of chaos". Speaking on Wednesday, however, Mr Corbyn ruled out any post-election coalition with the SNP. This result matters because Jeremy Corbyn's man won. The Labour leader still has an ally in the figurehead at the top of the country's biggest union. Unite's deep pockets have helped bankroll the party. Len McCluskey's passionate support helped buoy up Mr Corbyn when most of his MPs decided he was useless. Mr McCluskey's principal opponent, Gerard Coyne, had argued Unite should stop "playing Westminster politics" and "failed to collect a penny back" from its donations to Jeremy Corbyn's leadership contests. And so Mr Corbyn's man is still standing. The big question now is, if Labour lose the election, whether Len McCluskey will change his mind and call on him to go.